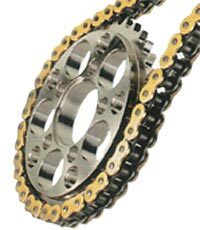 Our stock of drive chains covers a range of makes and prices. It is vital that the correct chain is fitted to your motorbike. Below is a rough guide to the chains that we can supply. extra heavy duty ZVMX grade with 'O' ring and 'X' ring variations. 415 to 530X1R. Prices and availability on request. We cannot be held responsible for you fitting an incorrect chain and/or sprockets.